Louisiana has a broad criminal justice system, one that employs approximately 70,000 individuals across fields like law enforcement, the courts and judicial system, corrections and law, according to the Bureau of Labor Statistics. Attending criminal justice school in Louisiana can position graduates to work in many rural and urban communities across the state, from Shreveport to New Orleans. 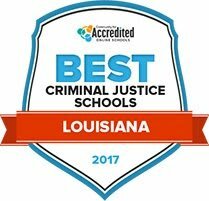 Learn more about the different educational options for criminal justice in Louisiana below, and find a program that fits both the academic needs and career aspirations of criminal justice students. After Criminal Justice School in Louisiana: What's Next? Not every student is created equal, nor is every criminal justice school in Louisiana. Some students want to attend a small community college, while others want to enroll at a public four-year institution. This list pinpoints the top institutions in Louisiana that offer criminal justice programs, ranking them by their tuition, acceptance rate, enrollment and other key factors. Learn more about the best criminal justice programs below. Louisiana State University-Eunice offers an associate of science degree in criminal justice. The program is open both to new students seeking to enter the field, and working professionals who wish to bolster their credentials and knowledge. The degree prepares graduates for entry-level work or for transfer to a four-year institution in pursuit of a full degree. Not only will students participate in an orientation, but they will be able to take advantage of many student services that the college offers. All students will be assigned an academic advisor upon registering, and counseling services are available. The associate of arts degree at Louisiana Delta Community College is a transfer program designed to carry over to fulfill the general education requirements of a full degree program, which students can then enter with junior status. The college guarantees that all 60 credits will transfer to any public university in Louisiana. The college, and all of its degrees, is accredited by the Southern Association of Colleges and Schools Commission on Colleges. Students will have access to library services, and will receive guidance from an academic advisor. There are also tutoring and counseling services available to students who need them. Central Louisiana Technical Community College offers an associate of applied science degree in criminal justice, as well as several certificates and a diploma in related fields. The college maintains several health and wellness programs, including one that offers help to students struggling with drugs or alcohol. Library services include a wide range of academic tools, such as computer basics, writing services and career services. Career services include help with setting and achieving goals, as well as preparation and improvement of "soft skills." This includes time management, communication, teamwork, critical observation, relationship building and conflict resolution. The criminal justice program at Southern University Shreveport culminates in an associate of applied science degree in criminal justice administration. Coursework focuses on both practical application and classroom theory. Among the many support services students will enjoy are academic advising and counseling, personal support and advocacy, and assistance with financial aid. Students will also receive career preparation and guidance. Students have access to a study area and computer lab, as well as mentoring and tutoring services. They can also take advantage of counseling services, as well as the services offered through the Center for Student Success. The Northshore Technical Community College criminal justice program is designed both for students seeking to enter the workforce and those already working who hope to achieve promotion within the field. Students can also continue their academic pursuits toward a higher criminal justice degree. Among the organizations open to students are SkillsUSA, Phi Theta Kappa and the Student Government Association. Tech support is available to all students, as are financial aid and transfer assistance. Students can take advantage of career and transition services, as well as academic advising and counseling. The college is accredited by the Accrediting Commission of the Council on Occupational Education. Northwestern State University of Louisiana gives students the ability to pursue both undergraduate degrees in criminal justice and graduate degrees in both Homeland Security and adult education concentration in Homeland Security. Students who obtain a bachelor degree in criminal justice have a wide variety of career options available in law enforcement and intelligence, the courts and corrections. Every spring, the department hosts a job fair where students can be interviewed for possible employment during degree programs and post-graduation. Interested students may obtain a post master's certificate in global security and intelligence. Loyola University in New Orleans has seen more than 1,000 students graduate with a criminology and justice degree since 1960. They offer undergraduate degrees as a bachelor of arts in criminology and justice or a bachelor of criminal justice degree. In addition, the University also offers a graduate program in criminal justice. All programs will expose students to three areas of concentration: organized crime, forensic psychology and deviant behavior. Students will also learn about the structure of the justice system, imprisonment and rehabilitation, operation of homeland security and the Supreme Court. The criminal justice program at Louisiana State University _ Alexandria prepares students for general understanding of the field of law enforcement, courts, corrections, and juvenile delinquency. The university offers a bachelor of science in criminal justice degree program, and will typically complete at least 60 credit hours to be eligible for graduation. Graduates should be qualified for career options in law enforcement, corrections, probation, parole, juvenile justice administration and private sector security. If students have interest in joining an on-campus organization, the Criminal Justice Association is available for students who are pursuing criminal justice programs. The Southern University at New Orleans offers a bachelor of science in criminal justice degree program, which introduces students to concepts in legal, legislative and social processes and how those relate to the criminal justice system. Relevant coursework teaches students about the following core areas of concentration: criminal justice and juvenile justice processes, criminology (the causes of crimes, typologies, offenders, and victims), law enforcement (police organization, culture and legal restraints), law adjudication (criminal law, procedure, prosecution, defense) and corrections (incarcerations, community-based corrections, and treatment of offenders). Through the department of social sciences at McNeese State University, students can pursue an associate of arts degree in paralegal studies, a Bachelor of Science degree in criminal justice or a graduate program in criminal justice. McNeese State University believes students can obtain hands-on knowledge through experiential learning and have the opportunity to complete three different internships at related agencies. Career options include law enforcement, corrections and court-related agencies at the local, state and federal levels. Adult students can complete a criminal justice degree through the online, accelerated format programs offered at McNeese. It can be challenging to decide not only what field to study, but where to complete a criminal justice certificate or degree. This collection of data on criminal justice schools in Louisiana provides students a searchable database to compare and contrast available programs and degree options. Students can use this search tool to find the right institutional and programmatic fit by learning more about each school's financial aid offerings, academic concentrations and degree offerings. Before earning a degree, it's important for students to map out possible employment options. Criminal justice schools in Louisiana provide many educational and degree options, and to help students identify a path that fits their professional goals, the table below includes details on some of the most popular criminal justice careers in the state. Learn more about the employment figures, salaries and academic requirements for these careers in Louisiana specifically below. Graduating from a criminal justice school in Louisiana doesn't limit students to a single career field. Louisiana offers numerous applicable career opportunities in legal and protective services - including several occupations that are growing faster in Louisiana than the national average. Use the graphs below to learn more about specialized criminal justice occupations in the state. Scroll over each bar for specifics, including degree requirements in Louisiana, to see which may provide a good return on the college investment. Graduates of criminal justice schools can select from any number of potential career paths in projective services, law or corrections. The biggest employment areas include the New Orleans and Baton Rouge regions, employing nearly 40,000 individuals in the criminal justice field. Use the table below to learn more about prospective criminal justice occupations and where you could find employment. A professional group for in-house business legal counsel and support staff, the ACC-LA provides career development and networking opportunities. A state program that provides community and small business resources including environmental regulatory assistance. The Louisiana Association of Business and Industry is the state's Chamber of Commerce and represents the interests of businesses in the state through regulatory, political and judicial processes. State agency that supports business development through regulation and enforcement of tax policies, workforce development and labor laws. A non-profit law group that offers investigative and legal services to prisoners currently serving, with emphasis on cases that may involve innocent individuals serving life sentences in Louisiana. This organization works to provide at-risk youth and community safety programs to prevent young people from committing crimes, and help reintegrate young people who have served time in the juvenile justice system. A group of criminal justice professionals dedicated to improving the corrections and criminal justice systems in Louisiana. The state department that oversees the corrections system in Louisiana and operates community corrections programs, reentry services, victim services and careers in corrections. An organization that works with incarcerated offenders to provide job opportunities and occupational and career skills training across many industries in Louisiana. A nonprofit organization launched in 2005 that provides legal and justice services to low-income residents and individuals affected by Hurricane Katrina. Recognizing the professionals and leaders in Louisiana's court reporting professional community, the LCRA was formerly known as the Louisiana Shorthand Reporters Association. Look up district courts of Louisiana and learn about the committees and initiatives Louisiana's District Judges have jurisdiction over, including civil, criminal, domestic and juvenile services and education. The state's highest court located in New Orleans that has supervisory power over all courts in Louisiana. A state branch of the National Center for State Courts, a nonprofit organization that serves as a clearinghouse for judicial information. A program part of the Neighborhood Housing Services, the center provides a variety of training and tools to communities to improve public safety and reduce crime. A website for individuals with low-incomes that provides self-help information and legal referrals through several nonprofits, as Southeast Louisiana Legal Services, Legal Services Corporation and Louisiana Bar Foundation. An all-encompassing collection of information on the legal systems, law and training requirements in Louisiana. Fighting for the notary practice in Louisiana, the PCLNA was founded in 1999 and continues better the notary community through networking an continuing education programs. A membership organization of 350 retired and active chiefs of police and other law enforcement administrators throughout Louisiana. State commission that administers a range of grant programs to support and improve the adult and juvenile justice systems. An association of the state's 64 sheriffs and approximately 14,000 deputy sheriff's that advocates for the legislation that supports law enforcement. A membership association of State Police officers in Louisiana, this group represents approximately 97% of active officers and a large number of State Police retirees. From training to tactical officer events and networking, the LTPOA serves tactical law enforcement officers across all agencies in Louisiana. Louisiana's resource for fish and game law enforcement, including regulation information, incident reports and information on how to become a wildlife agent in Louisiana. Nonprofit organization founded in 1986 that works in education and advocacy to solve environmental issues in the state. Explore the natural side of Louisiana through the State Park system, including information on employment opportunities. A statewide conservation foundation that has more than 9,600 members across 24 state and local clubs. A collaborative organization that assists business and government organizations to craft socially and environmentally friendly policies and incentives.